Since their creation in the late 18th century, music boxes continue to be treasured as collector's items. The "music comb" which is used to produce the sounds of music boxes was created by Antoine Favre in 1796. He was a watchmaker and he incorporated musical combs in watches, pendants, and perfume bottles. Which led to the magical world of music boxes. The design of the music comb consists of various lengths of steel teeth. A revolving cylinder of pins plucks the teeth to produce different musical notes. The pins are arranged in a way so that a melody can be heard from the music comb as the cylinder turns. The first real form of music box was a French mantle clock that played five songs from famous composers. It was designed by a man named Johann Maelzel around the same time that Favre created the music comb. The first music boxes were called cylinder music boxes. They were originally very limited in song selection. In the late 1880s, the limitations of cylinder music boxes were surpassed by the development of the symphonium, or disc style music boxes. The discs in these music boxes could be played for much longer. The boxes could also accept separate song discs, so many different songs could be played with just one box. MusicBoxAttic allows you to customize our music boxes, making them unique and special to you and your family. Customize our music boxes by creating your very own musical movement. Is there a song that means a lot to your family? Hear it play in one or two music boxes, guarenteed to bring many happy memories to your family. Or, write a personal message on a beautiful bronze plaque. MusicBoxAttic believes that the plaque adds sentiment to any of our music boxes. This is something your guest of honor is sure to never forget. Here at MusicBoxAttic, we carry both cylinder and disc-style music boxes. 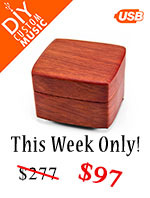 We have a fantastic selection of music boxes when it comes to design, color, shape, and size. Our song selection for our music boxes is also unsurpassed. 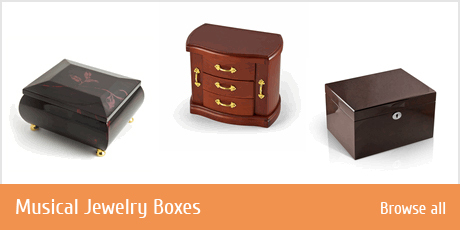 In addition to offering high-quality music boxes, we also provide excellent customer service. Please feel free to contact us if you have any questions regarding our products and music boxes. Below you will find a wide range of music boxe. 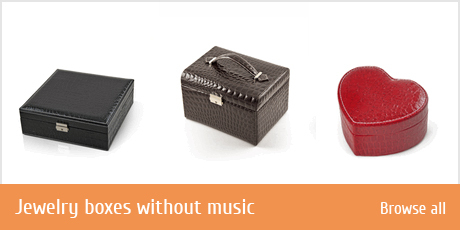 MusicBoxAttic's music boxes vary in price, style, size, color and any other music boxes attribute you can think off. Feel free browse our site at the left for many more music boxes! If you're looking for something tasteful and elegant, you're on the right site, and music boxes make an excellent choice. 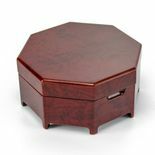 So whether you're celebrating or expressing sympathy, courting or just keeping in touch, MusicBoxAttic.com has distinctive and memorable music boxes that are appropriate for any taste and budget. Come in and browse our site. 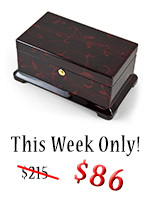 We have a large selection so you're sure to find plenty of music boxes that you'll love. 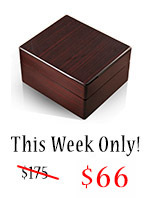 Don't forget, all of the music boxes offered at MusicBoxAttic.com is 100% satisfaction guaranteed. Jewelry music boxes at MusicBoxAttic.com are world renown for their quality. See our huge selection of cylinder music boxes, music boxes with locks, swiss music boxes, penguin music boxes, Italian music boxes, miniature music boxes, picture frame music boxes, unique music boxes, customized music boxes, disk music boxes, crystal music boxes, hanukkah music boxes, automated music boxes, burl inlay music boxes, angel music boxes, disc music boxes, Children's Music Boxes, Disney music boxes, childrens music boxes, children's music boxes, , Collectible music boxes and , piano music boxes. If you searched for music boxes ballerina, music boxes christmas, music boxes for sale, music boxes inlaid, mini christmas music boxes, carousel music boxes, fairy music boxes, wood music boxes, generic music boxes, animated music boxes, custom made music boxes, Music Box Company, Music Box Tunes, Ballerina Jewelry Music Boxes, Disc Music Boxes, Wizard Of Oz music boxes, Phantom Of The Opera music boxes, Egyptian music boxes, or Gone With The Wind music boxes, your search has been successful.